The following is a real-life example of a church supplied from a 208Y/120 VAC, 300 KVA, 3-phase pad mount utility transformer. 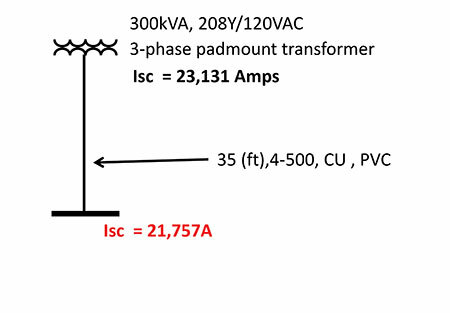 The published utility tables indicate the available short-circuit current at the secondary terminals of the transformer to be 23,131 amperes. The service lateral consists of four sets of 500 KCMIL, CU conductors 35 feet in length, installed in PVC raceways to service equipment. The Bussmann Fault Current calculator is leveraged to calculate the maximum available fault current at the service entrance equipment considering the service lateral conductors. The maximum available fault current at the service equipment is calculated to be 21,757 amperes. (See figure 7.) For this example, we will need to provide a label that meets 110.16(B). This is a 1200-amp service. The main in this panel in the field is a 1200 A molded-case circuit breaker. The manufacturer’s trip curve for this main OCPD is shown in figure 5. The curve is cut off at the fault current value of 21,757, the fault current at the panel. Because this is a 1200-amp circuit breaker, section 240.87 tells us that we must employ an arc reduction technology. The technology used here is the Arc Reduction Maintenance switch. 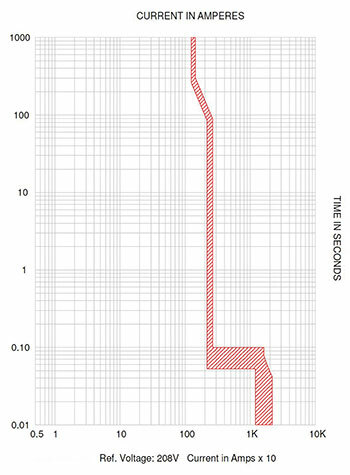 From this trip curve (figure 6) we know that for fault currents greater than 3,300 amps, the clearing time of the circuit breaker is 0.03 seconds or 1.9 cycles. Figure 1. The church service equipment of this example. Figure 2. Label as per positive text of requirement of 110.16(B). 4. Armed with arcing current values and corresponding clearing times, the IEEE 1584 incident energy equations are utilized to provide the maximum incident energy for this application. Figure 3. Label to meet 110.16(B) based on the exception using the calculation method found in NFPA 70E. 6. 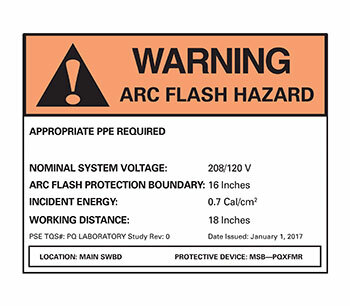 Those who would happen to perform justified energized work, including inspections within the arc-flash boundary, would review this label and wear arc-rated clothing that has a calorie rating greater than that shown on the label. The table method can be used to provide a label as per NFPA 70E Table 130.7(C)(15)(A)(b) or to help determine proper PPE when justified energized work or inspection within the arc flash boundary is performed and the label includes the information required under the positive language of 110.16(B). The following are the steps to determine the label or proper PPE. Note the voltage of the panel is 208 volts. The available fault current is obtained from that calculated at the service-entrance panel which is 21,757 amps. Note that this information is also printed on the label as part of the positive language of 110.16(B) and would be required as part of the steps to determine proper PPE to wear should justified energized work or inspection occur in the future. The clearing time of the arc reduction maintenance switch is 0.03 seconds. Note that this information, too, is printed on the label as part of the positive language of 110.16(B). This information is required as part of the steps to determine proper PPE to wear should justified energized work or inspection within the arc flash boundary occur in the future. Armed with this information, Table 130.7(C)(15)(A)(b) is consulted, the parameters of available short-circuit current and fault clearing time is met and the arc flash PPE category is determined to be 1 and, as per the table, the arc flash boundary is determined to be 19 inches. Figure 4. Label to meet 110.16(8) based on the exception using the Table method found in NFPA 70E. Note that the positive language of 110.16(B) provides enough information to utilize the Table method of NFPA 70E. Figure 6. 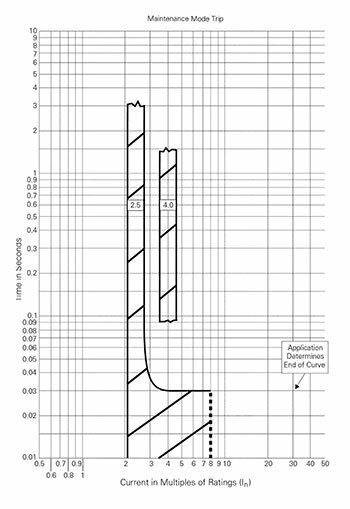 TCC curve for the arc reduction maintenance mode of the 1200-amp circuit breaker. The clearing time is shown at 0.03 seconds. Figure 7. Single-line diagram of the service application showing the calculated maximum available fault current of the service-entrance equipment.